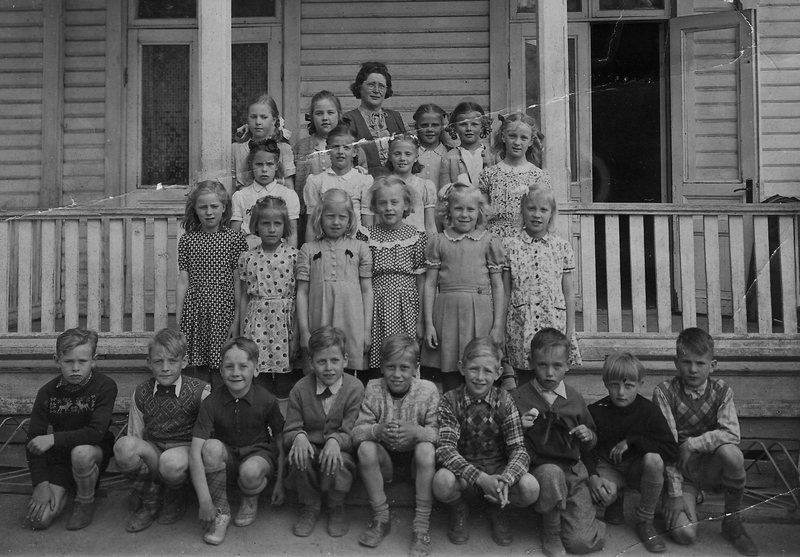 Luther Chapel, children and teacher in front of the porch in 1948. They are standing on the porch of the Lutheran Chapel at Kvarnbacksvägen in Bollstabruk. The year is 1948 and it’s the second year of classes. The chapel served as a school back then. It’s a blessing to sit on a porch in Ångermanland, early on a summer morning, enjoying a cup of coffee and reading the newspaper. Or as it probably is in this case, to have been photographed with your class mates and teacher in the 1948 and still having the photograph. The children look very happy and their teacher seems very proud. I heard she was a very nice teacher. One of the girls told me she still keeps a hair clip from that time. She keeps it in a little box and cherishes it tenderly. This she has told me. Her eyes glitter when she speaks of the hair clip. She is full of laughter and other stories as well. You may meet her when you are out for a walk, a hike or when there’s a cultural event in the village. She has travelled around the world. And she loves soccer. I will have to ask her about her class mates and the teacher, their names and anything she could tell me would be interesting. I think they look very happy and I have a feeling they enjoyed the time spent at the chapel. There is still a sense of happiness and serenity there. To enter the big prayer hall is an experience in itself. The height of the ceiling and light coming through the big windows has a remarkable impact. Your spirits lift. 10 minutes is plenty of time. A visit soothens ones soul. Such a beautiful building could host the most wonderful gatherings and events. The girl with the hair clip is very beautiful. Her sister is very beautiful too. Maybe the Olsson sisters that once took care of the church and the levels at the adjacent railway crossing were beautiful as well. However, I cannot confirm that. That was long before my time. The girl with the hair clip and her sister you can meet at the soccer field when the local team plays. Always full of laughter and kind words. The Porch at the Lutheran Chapel in June 2013. It’s a blessing to live among such beauties. But time is short now. The chapel needs attention, a new roof and restoration. I wish I’d find some friends that would cherish it as tenderly as the girl in the picture from 1948 cherishes her hair clip. It would break my heart if we would loose such a beauty. I will be on my way to a beautiful summer day in Bollstabruk to dig in the soil and plant some seeds and flowers. The guerilla activity continues to rescue this beauty. 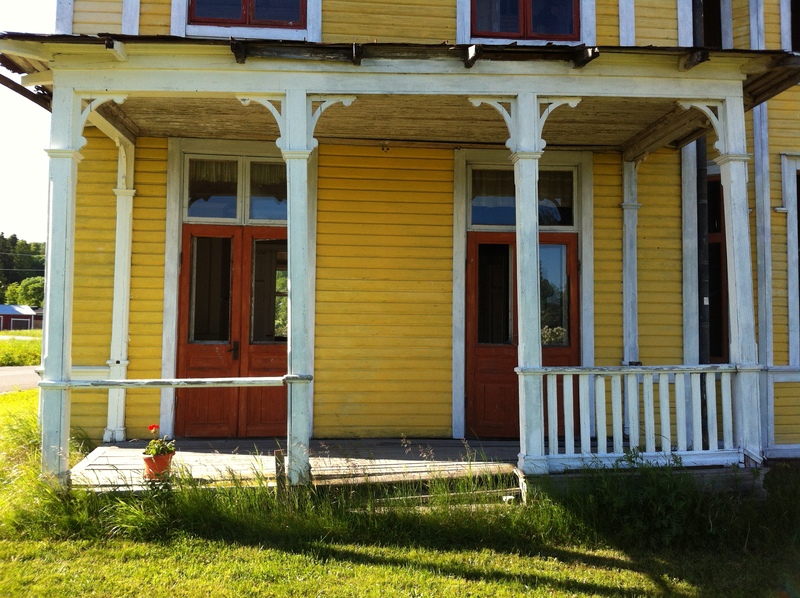 What is it that attracts some of us to old buildings and objects? Watch the trailer below ”A compass to beauty” – a film by Inga-Lill Snitt about Lars Sjöberg (Athena Film). Read more about the Luthern Chapel in Bollstabruk, Sweden on the link below.